I love that knitting for babies is quick, but my last experience knitting a baby sweater was semi-frustrating so I was hesitant to try it again. In fact, it’s been a year since I last knit something for a baby, but my baby brother’s wife is expecting their 2nd child in September, so you’ll see a bit of baby knitting here for the next few months. 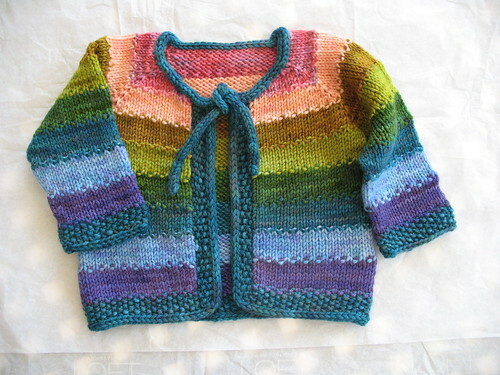 I started off with the Elizabeth Zimmerman Baby Surprise Jacket, but now that I’ve taken a close look at it, I’m going to rip it back and start again. I thought adding a complimentary color stripe of the ArtYarns Supermerino would be great, but for this pattern, not so much. I think it looks a little bit like a poo stain on the back and sleeve ends. Although I was going to tackle the Elizabeth Zimmerman Baby Sweater on Two Needles next, I remembered that I’d purchased the Tulips Baby Cardigan kit while I was at Stitches West. 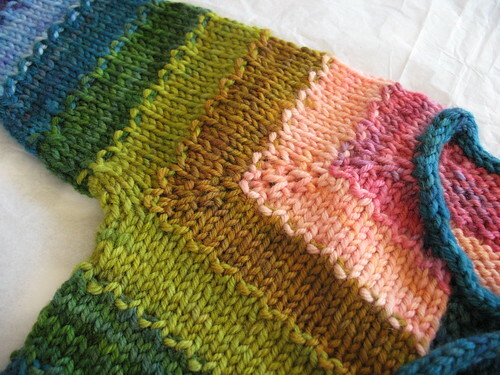 The kit I purchased included the pattern (for all sizes) and enough yarn of the eight colors needed for this pattern for a 6-9 month old baby. The entire kit cost me $45, and I think I may even have enough yarn remaining to knit one of these for a newborn or maybe even one of those American Girl Dolls that my nieces are crazy about. From the moment I cast on, until the moment I cast off, I honestly enjoyed knitting this sweater. 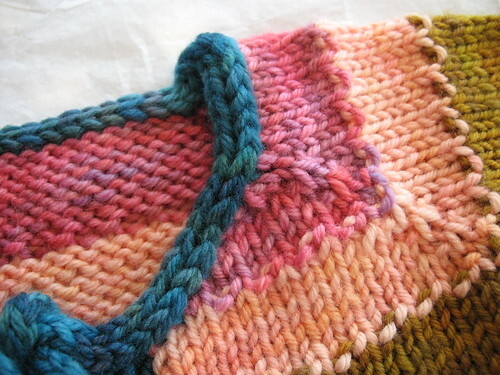 The pattern is relatively simple and the detail of the i-cord bind off around the edge is the perfect finishing touch. The yarn is not only a very soft merino and easy to work with, but the subtle color shading is beautiful. I highly recommend this pattern and yarn to anyone needing a baby gift. I may be slow responding to emails and blog reading for the next week. Hubby and I are driving from California through Nevada and Utah to Idaho on Tuesday morning for my dads retirement party. He is finally retiring on Friday from serving the public as a police officer for 43 years. I’m worried about him retiring though. Law enforcement has been his life and he seems to be a bit depressed lately. Mom mentioned that it might be nice to get him out of his environment and to drive back with us when we return to California. I guess I better get my knitting and spinning projects out of the guest room. What an adorable sweater! You did a marvelous job on it, and I’m sure your brother and sister-in-law are going to be thrilled with it! My Feb. Lady Sweater has been my first experience with DIC Classy and I can say that I’m a convert now. It’s a great, great yarn. The sweater is just so cute! Be careful driving and have a good time. That sweater is SO ADORABLE!!!! 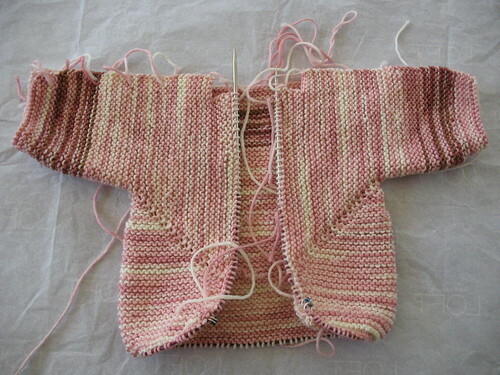 I love looking at baby knits, so I can’t wait to see what you knit up next. Have fun on your little trip. And I hope your dad finds retirement much better than he imagined. I almost bought that kit once, but I don’t have a baby to knit for right now. I love knitting little baby sweaters, though. So cute and so fast. Yours looks great! Actually, I love both of them. Have a safe trip to Idaho. I hope you get to do some fun stuff while you’re there! That Tulip sweater is always adorable! Have a safe and fun trip to Idaho! Maybe you can get your dad interested in a new hobby to become consumed with 🙂 We know how well it works! The Tulip sweater came out so well! The colors are so sophisticated. Congratulations to your dad! I hope the transition into this new stage is easier than expected. The Tulip sweater is adorable. 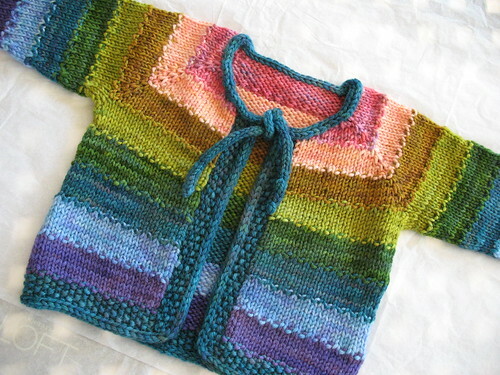 I’ve been wanting to make one of those but need a baby to knit it for. Not one of my own mind you!! No, a friend’s baby will do just fine. Both sweaters are lovely! I’m sure your visit with your father will cheer him up a bit. A change of scenery is always nice. I love the baby surprise jacket! I think the colors are fabulous. And the Tulip. Well. It’s stunning, gf. I hope you bring both of them with you to knit night tonight. Hint, hint. I have been wanting to knit the Tulip sweater, hmm, ever since I first saw it. Yours looks fantastic! I like the Tulip one sooooo much. I am not a big BSJ fan, though yours is very cute. I guess you have to knit one to understand how great it is, at least that is what I am told. Keep going all these baby things are too cute! I just love that sweater!! I have the pattern, but not the kit! hmmm….maybe I should indulge, because yours is too cute! Those are so adorable! Have a great time!! Oh _look_ at that tulip sweater! I’ve been kicking the idea of snapping up one of the kits for a while, and I think you’ve pushed me over the edge. Now that we have a little girl arriving in December I’m having a hard time _not_ knitting up fabulous little things for her to wear. But I have to keep moving on the Christmas knitting, since she’ll arrive about a week prior. I also think you’re BSJ is adorable… and I have to disagree about the brown. I think it’s a fabulous little contrast. Before you go and frog the whole thing maybe you should try to add a bit more of the brown to the button front/bottom edge. It might detract from your “visions of poo” and pull the whole thing together. And hey, it’=ll only take few minutes to see whether or not it works; if it does, it will save you a whole lot of re-knitting, and if it doesn’t, frogging a few extra rows doesn’t really take any extra time! Oh I love the BSJ! doesn’t look like poo… and the Tulip sweater is a favourite and yours is so pretty. don’t rip the BSJ! I love the accent colors, that’s the first thing I thought about when I saw the picture! 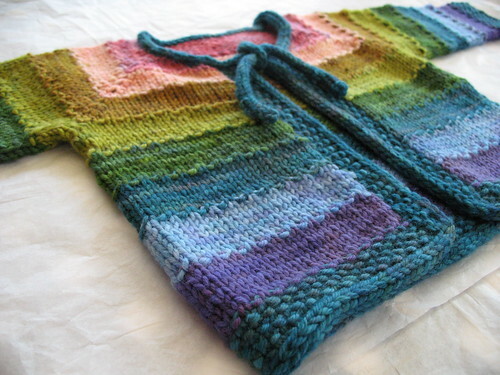 and the tulip cardigan is gorgeous. Both baby sweaters are very cute! You did a superb job on the Tulip Cardigan. It is adorable! I hope you have a fun and relaxing drive – maybe you can get quite a bit of knitting done in the car! I have heard that men can get depressed when they retire. I think they just don’t know what to do with themselves! Hopefully your dad will find something to do that can is fun for him and fulfilling. Tulip is a gorgeous sweater and colors too!! Glad to know you enjoyed this so much — I may have to break down and buy the kit!